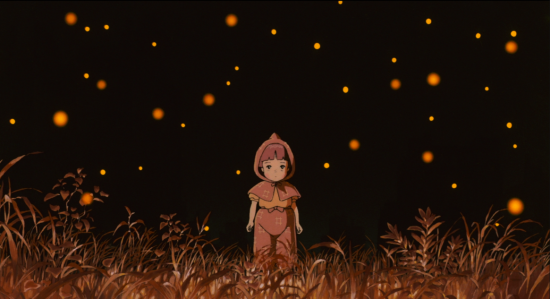 A scene from Isao Takahata’s “Grave of the Fireflies” (1988). Japanese anime director Isao Takahata received a juried award for lifetime achievement during the 43rd annual Annie Awards ceremony, held Feb. 6 at UCLA’s Royce Hall. Presented by the International Animated Film Society (ASIFA-Hollywood), the Annies honor overall excellence as well as individual achievement in 36 categories for film and TV productions. “In any language, Isao Takahata is an extraordinary filmmaker,” Solomon continued. “He’s been many things in his life and career — a student of French literature, an animator, a television director, a screenwriter, a documentarian, a producer, and co-founder of the celebrated Ghibli Studio. “Finally, there is his concern for the ecology and the planet. In ‘Only Yesterday,’ Taeko learns the country landscape is largely a human creation, yet she loves it nonetheless. And beneath the slapstick humor of ‘Pom Poko,’ we sense the loss of the forest the tanuki once inherited. Geoffrey Wexler, head of international releases for Studio Ghibli, read a statement from Takahata: “Winsor McKay. The very name evokes memories of a man I greatly revere and adore. What a wonderful award, with a host of glittering stars and awardees that I deeply respect. That I have the distinct honor of becoming a humble member of this constellation gives me immense joy. I accept this award with delight, and I would like to express my heartfelt gratitude ASIFA-Hollywood for presenting this award to me. The award is named for Winsor McKay (1869-1934), an American cartoonist and animator best known for the comic strip “Little Nemo” and the film “Gertie the Dinosaur.” The other recipients were Phil Roman, founder of Film Roman, and the late Disney/Pixar animator and voice actor Joe Ranft. Pixar was the big winner of the evening with 12 awards, including Best Animated Feature, Outstanding Music (Michael Giacchino), Outstanding Voice Acting (Phyllis Smith as Sadness), Outstanding Production Design (Ralph Eggleston) and Outstanding Editing (Kevin Nolting). Other winners included “He Named Me Malala” for Best Animated Special Production, “Wander Over Yonder” for Best Animated TV/Broadcast Production for Children, “The Simpsons” for Best Animated TV/Broadcast Production for a General Audience, and “The Revenant” for Outstanding Achievement for Character Animation in a Live Action Production (for the CGI bear). Presenters included Edward James Olmos (“El Americano: The Movie”), Rita Moreno (“Nina’s World”), Kristen Schaal (Outstanding Achievement, Voice Acting in an Animated TV/Broadcast Production winner for “Bob’s Burgers”), Tom Kenny (“SpongeBob Squarepants”), Laraine Newman (“Dawn of the Croods”) and, from “The Peanuts Movie,” Alexander Garfin (Linus) and Hadley Belle Miller (Lucy). For a complete list of winners, visit www.annieawards.org.